Get an endless fun with Jump Robot! Get ready for an amazing adventure on your iOS and Android devices! This is a jumping game that will surprise and fulfill the expectations of the many fans of the series “Doodle Jump” and “Mega Jump”. This game is believed to be a great leap forward within the familiar framework of usual platformer mechanics. From the creators of Last Robots series comes a new platformer entitled "Jump Robot: Space Adventure", a brand new entertainment for everyone. The game is brought to you by Absolutist, developer and publisher of casual games, and is scheduled for release in September 2012 worldwide. Customers can purchase and download the game from the AppStore and Amazon App Store markets. A free lite version is also available. 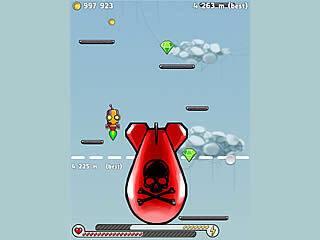 Jump Robot: Space Adventure is developed to bring a new quality concept to the jumping games genre. 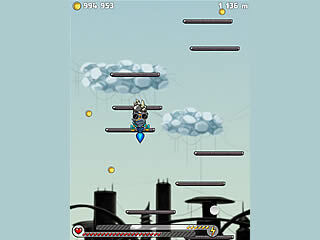 Drive your robot to lethal heights as you jump between platforms gathering coins and lives. Players can use their earnings to buy lots of cool upgrades in a store and to add a unique dynamic to the gameplay. Another great feature is an enhanced system of power-ups. Add turbo engines, high octane fuel, titan springs or buy add-ons to adjust every part of robot's appearance. Customizable items increase the strength and durability of your robot. This is just the beginning, players can expect to get even more modifications and upgrades in the full version of the game. Every level is a challenge, because layouts of the stages are never the same. The player’s success depends on his ability to effectively use tilt controls and customizable features. Jump Robot:Space Adventure also includes game center, power-ups and upgrades, virtual currency, spectacular animation, amazing slow-motion effects, explosive audio and endless gameplay. This game is sure to appeal to an audience of all ages. So, have fun and navigate your way to the victory! Get this game on the App Store!